I come from a long line of farm women, all who learned to cook for large families at a very young age. I remember my Mom talking about making bread in large wash tubs as a 12-year old on the Western Slope. Enough to feed a family of 10 or 11 and any farm or harvest hands that might be there as well. While I didn’t inherit her knack for working with yeast — my few feeble attempts at yeast bread look like rejects from the brick kiln — I do enjoy my time in the kitchen and have acquired some skills of my own. Over the years, I’ve managed to collect a rather substantial number of cookbooks, well over 72 at last count, and I especially like the small regional cookbooks produced as fund raisers for various organizations. I probably have the world’s largest untried recipe collection as well, torn from magazines or downloaded from the ‘Net. A recent project included indexing and organizing a 3-inch three-ring “D” binder to hold the additional recipes — which also meant throwing out quite a few that didn’t sound as good upon second (or third) reading. Or contained too many steps/ingredients. I’m definitely into easy comfort food. With the return of fall and cooler weather, I am always drawn to a favorite recipe, first shared by an elderly aunt on the Western Slope and who grew up on a farm in The Depression. Chock full of apples, cinnamon and pecans, the smell of it baking wafts through the house and brings to mind autumn’s bounty and the drop in temperature soon to follow. It’s also a good way to use up those apples that, unless eaten quickly, will head out to the compost bin. Which is what happened today with apples soon headed to the compost pile! I’m trying something different with this recipe. It bakes up an absolutely fabulous crust so I’m using a Bundt pan to see what results. 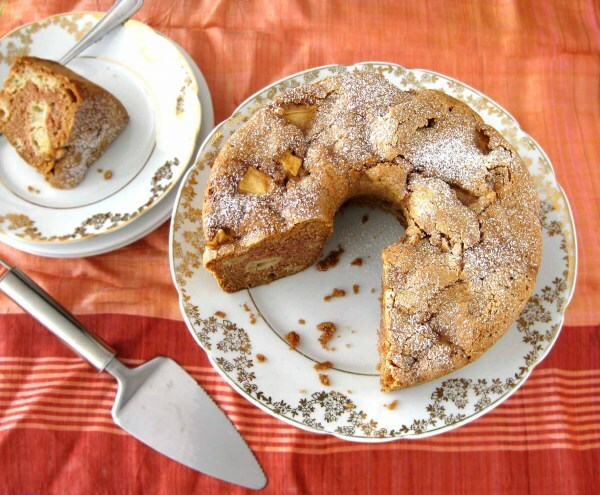 Whenever I take this cake somewhere, I’m always asked for the recipe … German Apple Cake. It has now become a classic at our house and is often requested at family holiday dinners. Along the way, I’ve also picked up and developed several dog biscuit recipes. Not surprisingly, a favorite here is an apple recipe that is allergy friendly, using oat flour instead of wheat, and safflower oil instead of corn oil. When I was doing quite a bit of dog cookie baking, the dogs were *very* aware of what was in the oven and eagerly anticipated their special treats. When the oven beeper would go off, they’d race to the kitchen to see what was coming out for them! Here’s to sharing the taste of autumn with the four-leggers … Cinnamon Apple Snaps. P.S. As a side note, the Bundt pan worked beautifully! Lots of yummy, crunchy crust with little adjustment … I dropped the temp 25 degrees (to 325) and used the convection option on my oven (ergo the temperature adjustment). That cake looks and sounds so good! I’ve been wanting to make a Fall dessert so I might have to try this. This apple cake looks scrumptious! And I love the cinnamon apple snaps recipe. I need to cook this up for my Tzus, since our newest loves his apple treats.